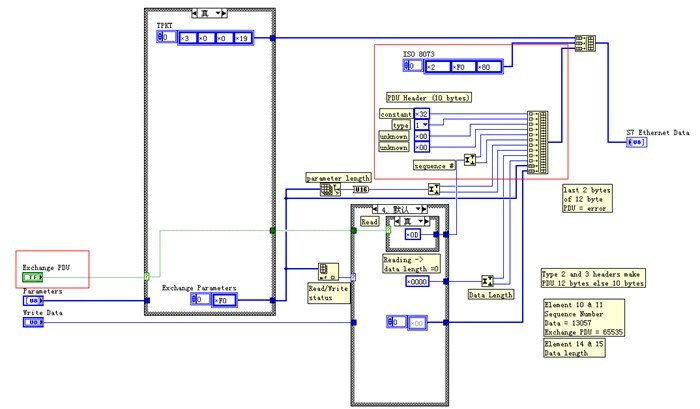 This example provides a library of LabVIEW VI's that can be used to communicate with a Siemens S7-300 PLC via an Ethernet port over TCP/IP. This example communicates with a S7-300 series PLC through Ethernet TCP/IP - no adapter is needed. The example provides an API to read from / write to registers on the PLC. To my knowledge, Siemens has never released the details of the S7 protocol. Much of what is publicly available on S7 is based on observations of the protocol by others. There is an open source S7 data exchange package available at http://libnodave.sourceforge.net/ that documents many S7 features. These VIs were based upon the example posted at http://decibel.ni.com/content/docs/DOC-5467. 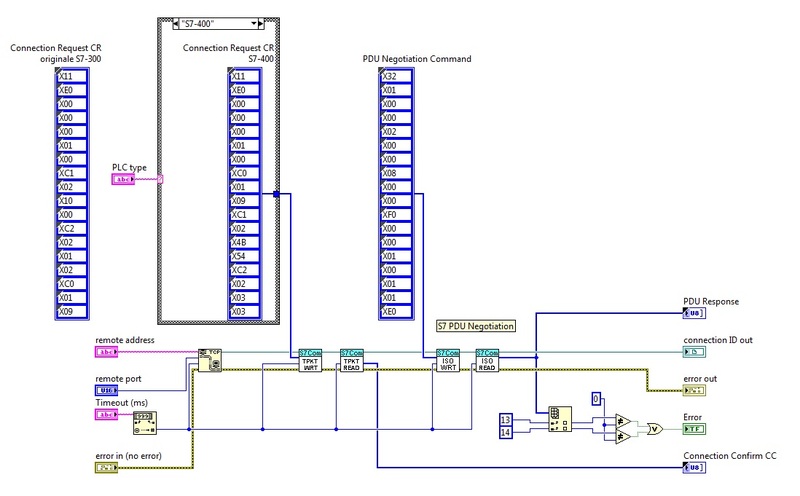 They were modified by observing and mimicking a S7 data exchange between a protocol converter and a S7-300 series PLC. The observations were accomplished with the wireshark network protocol analyzer, available at http://www.wireshark.org/ and the Wireshark Plugin für S7-Protokoll, available at http://sps-forum.de/showthread.php?p=202763. The example contains two top-level VIs: S7Com_Once.vi and S7Com_W+R_Loop.vi. 1.S7Com_Once.vi performs one read or write per execution. It writes to the target PLC from an array of I32, it reads from the target PLC into an array of I32. The number of bytes written is proportional to the number of elements in the array to be written and the transport size parameter. 2.S7Com_W+R_Loop.vi regularly writes to and reads from a pair of DBs in the target PLC. In order to use it, your Step7 PLC project should provide two Data Blocks, DB11 and DB12. See the screen capture image db11&12.PNG for their layout. After downloading the DBs to your PLC, monitor and change DB VAlues with a VAT. As can be seen in the VI, the transfer size is DWORD. 3. For more information, refer to the Read Me included in the download. This code was provided by a fellow developer (thanks!) and uses a slightly different architecture. Note - the attached files are experimental VIs provided for educational purposes only. No warrantee is expressed or implied. You should test your code and completely understand the implications of writing to or reading from an operating PLC. It's useful,but missing one vi named S7 Read Write Cluster Array.vi. sorry - missed that VI. Uploaded a new zip file with it included. Very nice code. Thanks for sharing. I am not aware of the differences with the CP 243 ethernet module vs the 343 (which this code was used with) - I could not say if it would work or not. If it does not work, you might be able to find some information through http://libnodave.sourceforge.net/ (an open source S7 PLC data exchange code) helpinig find where the LabVIEW code needs to be changed for 200 series communication. This is a very cool code. Thanks. One problem I have is the Read works fine but the Write returns error 66. Is there a port I need to open up or something else to grant access to? Have you compared this performance wise to DSC with an OPC connection? With just a limitied number of reads it seems pretty fast but I'm wondering if it will slow down with a larger number of register reads or writes. The program uses the port 102 for communication. If you are getting error 66 " The network connection was closed by the peer." - then you might want to double check that you are not trying to write to read-only registers. But I have used this program almost exclusively for reading registers - there could be a bug with some writes. The register read speed should scale linearly with the number of registers desired to read - should be same with OPC - but I have not benchmarked it. My guess is that it would be faster than OPC having the direct call to registers. There are ways to optimize reading large chunks of DB blocks - if you need this, let me know. Hi, thanks for the reply. No luck with the writes yet. I tried testing to some memory bits as well as a few different DBs. They should not be read only registers. I'd be interested in optimizing reading large chunks of DB blocks. One of the problems with our current PLC program is that the HMI reads read all over the place. We are in the process of consolidating all the HMI ins and outs to a couple data blocks. -Thanks. I added a newer version of the VI's that I have used. I do not have a S7 to test the code with anymore, so if there are bugs and you find a fix, please post them back on this site. The new version (3.1) does have a "optimization" routine that will group reads from the same DB block in a single TCP read. If most of your data is from a single DB, it will be significanly faster. The optimization will not work if you are reading to locations other than DB blocks. Reading working OK. But when try to write, there is error "66". Where is the problem? Thanks again for sharing your code, certainly do apriciate it. "TPKT" and "Connect to Adapter" send from the VI "S7_Init_Adapter_TCP.vi" fail to awaken the module since I get a TCP read timeout when trying to read the expected 22 char return answer. Siemens wants aprox $4000 for the MPI protocol, so I realy wanted to see if I could get away with not investing this amount. To test that the S7-system was functional, I configured the NI OPC Server with the S7 driver (2 hours trial mode duration). This worked fine and I was able to configure tags for certain addresses from the S7 and directly port them to Shared Variables. I am trying to implement a GUI for the S7 on a WinCE 5.0 touch panel from IVCDisplays.com running LabVIEW PDA. On this platform I can't operate the NI OPC Server, however, raw TCP/IP calls work just fine so this would be a good entry point to making nice-looking GUI's for S7 installations. The NI-OPC server was configured with a TSAP 1001, I dont have any idea of what than means, but a S7 guy told me that was needed. Does anyone out there have a bit more information on the MPI protocol from Siemens ? http://www.wireshark.org/) to scope the packets on the TCP/IP connection to the CP-243. 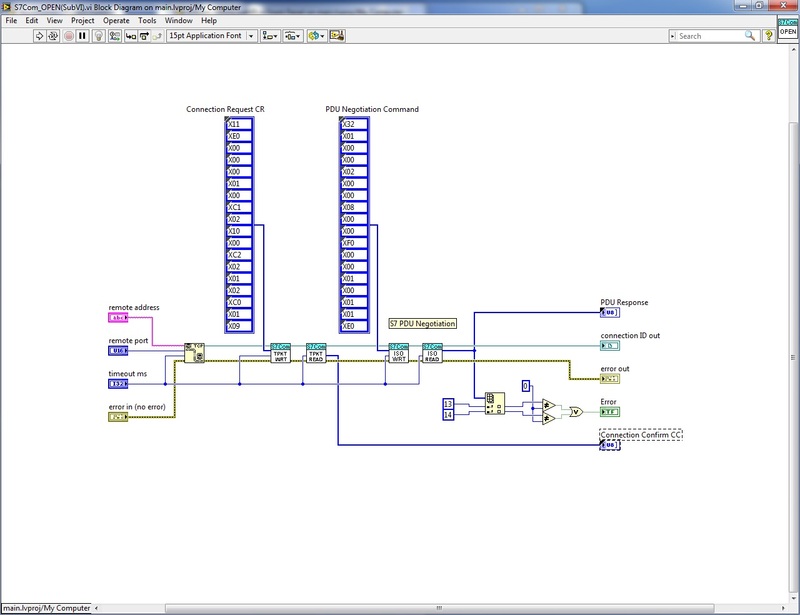 Compare what you see with the OPC Server and the LabVIEW code. The connection hex values are slightly different depending on what type of adapter you are connecting to (I have used both a serial and CP-343). The read/write transfers should be the same. Hope that Helps. If you find out what the difference is - let me know. I'm from National Instruments Brazil, and a customer just downloaded this code, but he is looking for a code that can communicate with multiple PLCs. Does anyone have a code that can do this? Finally had some time to look at this again and try to determine why I can't get the Write mode to work. I downloaded Wireshark to compare the difference between what this code sends and what my OPC server sends when it asks for the same info. Unfornuately I'm very much a newbie with TCP protocol in general so I'm essentially deciphering it based on your comments in the code and some, so far not so good, web searches. Here's what I got so far... hopefully you can follow it ok - I'm disecting the data packet and noting any differences between the OPC server and this code. Sorry if I mess up on the nomenclature a bit. When sending a read request, the packet data is nearly identical. The only difference is what your code has labeled sequence # is 3301 in LV and 0066 in the OPC server. However both work so I'm assuming that seq # is not that critical. When sending a write request, the packet data has some more differences. I assume transport type tells the PLC something about the data type so might be a problem. The OPC server sent the entire new value (5 in my case) in one send (00 04 00 20 00 00 00 05) - the first part of that is write header info which is also different 00 40 00 20 as opposed to 00 04 00 08 - does the 20 and 08 indicated the length of the write value? 20 hex would be 32 bits which is what it sends down all at once. So why does it loop through this byte by byte instead of sending it all at once? I suppose it could do this if it only writes 1 byte at a time but then wouldn't it have to change the starting address if its writing a long word to tell it where to write? Registration is required for access to the files. I do not speak German, but I was able to register by reading the German text via a google translate window. Go to the end of the posting (now on page two) and get the latest version of s7comm_dll_090712.zip. The source is also available. A look at the source can reveal the possible values of many of the fields. Problems writing with the example code may be related to the read length field. When writing, the read length field must contain a write length parameter based on the number of data units (bytes, words, dwords), not bytes. I am working on this using a S7 318-2DP + CP 343-1 and a bridge device. When this device opens its connection there are two frame exchanges that the example does not have. The first is labeled as a TPKT Connection request. The PLC answers this with a connection confirm. The second exchange is a ISO/S7 Comm exchange that wireshark identifies as S7 PDU negotiation. What is the maximum reading and writting lenght (for one item)? 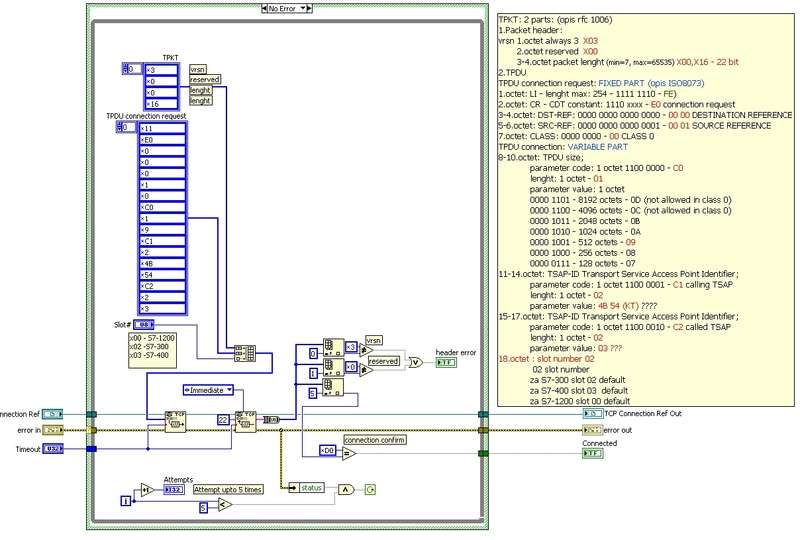 I try and it works till 10 bytes (reading). If I try with more then 10 i get empty response. TS9 - "S7Com_2009_11_06.zip" was forwarded by a fellow developer. See the file in the download section above. The code is a little different from the original code, but read and write should both work. bobi - "S7Com_2009_11_06.zip" was forwarded by a fellow developer. See the file in the download section above. The code is a little different from the original code, but read and write should both work. I could find the solution on not writing in DB of PLC. There is a very small mistake in the code; the packet size for both write and read request remains same, where as it is different for both. You need to alter a vi "S7_Read_Write_Data_TCP.vi" to solve this issue. Fourth byte (index 3) of the packet "S7 Ethernet Data" should be replaced by the size of the total packet. This packet is generated by "S7_Build_Message.VI" connected to "TCP Write" vi. Kunalb - thank-you for your catch of the write bug. I made some edits based on your feedback and what is also in the S7Com code - the new code is uploaded as Siemens S7 TCP v3_2 LV 8_5.zip. I do not have hardware to test these changes. Can you or anyone else give me feedback if the write bug is fixed? I tried with the new zip, unfortunately it didn't work. I have uploaded the API lib zip. Please check the vi "S7_Read_Write_Data_TCP.vi" I have modified. Using this API lib, I could read/write 100 bytes of single DB. I have not tested rest of the VIs (read_write_cluster_array, etc.). Might require to alter accordingly. I have tested this code on PC as well as cRIO. Thanks for the code, very useful. Usually a S7 300 cpu will be in slot #2 while my S7 400 is in slot #3. From working with nodave&prodave I knew the rack & slot numbers of the cpu must be specified to initiate a connection. So without any further knowledge of how the protocol works exactly I decided to do some trial & error changing of values in the constant arrays used to create the packet sent to initiate the connection in S7_init_Adapter.vi. At my the third attempt the connection was no longer refused with only the last (18th) element of the constant array "Connect to Adapter" changed from x2 to x3. After this change the read & write functions of the VI's look to be working correctly. I did the same with the S7Com_2009_11_06 sources, with similar results after changing a value in the S7Com_OPEN(SubVI).vi where there is a similar constant array used in creating a header. Hope this is useful to anyone. It looks you are right. For connect to S7-1200 18th element should be changed to X0. The default slot# for S7-1200 is 0. I shall have liked knowing how made you to analyze and establish wefts for the communication TCP IP beetween a S7 PLC and Labview. It is the very good work in any case! Congratulations. Used you a software as wireshark? Which function of step 7used to communicate with the automaton. You are connected to you on the PLC? Created you a table of variable under step 7 and analyzed and reconstituted wefts between the PC and the PLC? I shall really like knowing how you have to constitute this code, it is really the good work! Congratulations. Yes - all of those methods were used in developing this. By the questions you are asking you understand the depth of investigation and time it takes to create a custom connection like this and understand that detailing all the steps would take a significant amount of time. I'm glad you find the example useful! Hi MarcoPolo5, i am about to evaluate the feasability of a server for the same protocol. have you ever done some test about? Thanks for this software, MarcoPolo5! I`m using a Siemens S7 315-2 PN/DP to log 12 analog trends, 1000 floting point samples for each trend. This information is stored in 4 different DBs (3 trends in each DB). I want to present this data using a LabVIEW-application. Using a for loop, I`have modified the "S7 Read Write array" inside "S7 TCP Test2.vi"
to contain all the 12.000 elements. The loop time is 72 sec. Can you think of a way to improve the loop time by using a different technique? Ladejarlen - the S7 PLC is somewhat slow in sending/receiving data through this protocol. However, there are a few ways to speed things up. If the data you are requesting is next to each other in the DB block, the data can be read out as a block read rather than each element individually. To do this, use the VI included in the "Siemens S7 TCP v3_3" code called "S7_Optimize_DB_Read_Array.vi". If you feed your read array into this, it will optimize the calls and read blocks rather than individual elements. This doesn't have a lot of testing done on it- but last I checked it worked. The other way to get data faster is to write a routine on the S7 that will send out data via TCP - however this requires writing additional S7 code. Please tell me am I right to select for ethernet's communication between S7 and LV is CP 343-1 Lean ? Or may be another device is CP 343-1 V2 ? Can't say which is better - not familiar enough with differences between 343-1 Lean and V2. I believe I used the V2 in testing. For differences in the various Siemens CP 343 series, see: http://support.automation.siemens.com/WW/view/en/16767769 Pay attention to how many S7 Connections are needed. Thank you MarcoPolo for sharing your code! All works fine without any S7 drivers on the PC side! Although I thought that the Simatic Net is necessary. Bobi, can you help me, please? The port that I have setted is 102, I think the problem is in TPKT connection, can you explain to me better what you said with "For connect to S7-1200 18th element should be changed to X0. The default slot# for S7-1200 is 0." I attach a photo of diagram VI if you find the error. Look at the attached photo of a diagram. It is initialization of TPKT. I hope this will help you. Thank you, I have changed my values of inizialization of TPTK with yours and it works! You help me very much, great! For sure the VIs are working. I tested this in office. It's excellent. But i have another puzzle: if i want access more different data block at the same time, how can i do? For example: to read data from DB10,DB11 and DB13, how to organize the sending message? And, if there are two CPUs in one rack, how to organize sending message to access one CPU? need assign slot number? If you want to access more data at the same time, it would be better to have all DBs sequenced in READ one after another; if it is a contineous ongoing process. If you want to read the DB on demand, you can do at any time. But make sure you are not reading two DBs at a time; may be parallely. This might result in unknown feedback. It might result error or success since it is not an OPC server. I am not sure if anyone have worked on two CPUs in one rack. Better give a try, it might be a Case Study of users. As i know, some data recording software, as IBA, it can get a lot data from CPU, and check them on-line, it looks that the datas got at same time. In my lib there are some PLC station, one of them has 2 CPUs in one rack. I tryed to rread data from this station, but failed. I think need set slot number in sending message. But i don't know how. hello bobi ,i feel difficult to understand S7_Build_Message.vi because i don't know what protocol is used in it.Can you explain to me ? By the way ,i don't know the function of “Exchange PDU”.i wanna know the answer where are framed painting by red line in the attached picture . Hope you can help me . Thank you very much! Parameters without labels are some fixed parameters used for comunnication. You can use Wireshark (http://www.wireshark.org/) to scope the packets on the TCP/IP connection. I am trying to communicate s7-1200 PLC communication with the LabVIEW using the TCP/IP communication.I need the configuration details for the PLC.How to configure the PLC to communicate with the LabVIEW.I need the help. Many thanks for sharing this code.Its working fine with S7-300 series PLC. I would like to communicate with S7-400 series PLCs in same manner. I am also looking for comunication with S7-400 PLC. I think you can help me by providing code for the same. Its working fine for S7-400 PLC. first of all thanks for the code that you shared. The communication works perfectly. Unfortunately, I have a problem of interpretation of the data; I have a variable stored in the plc: 10.00; in labview I set "S7_Transport_Size = REAL" and the result is 1092616192. In the front panel of labview instead, I would read 10.00. If I change to "DWORD" I always read 1092616192. What is wrong!?! ?